I’ve never been a lawn guy. I’ve lived in the suburbs for six years, and had my own lawn to care for some years before that. But I don’t take any pride in my lawn like guys are supposed to. A well-manicured lawn means absolutely nothing to me. I secretly dream of plowing the whole thing up, salting the earth, and covering it in sand—complete with an umbrella and a beach volleyball net. Maybe it’s laziness, but I like to think it’s my rural roots. I grew up on a farm—40 acres in the middle of nowhere. Out there, you don’t mow the lawn, you cut the grass. It’s not about appearances, but being able to walk to the mailbox without getting covered in ticks. Cutting the grass was something we had to do, and it didn’t matter how well we did it because the neighbors weren’t going to be impressed—they lived a half mile away. So, I mow my lawn, but grudgingly. When I moved into my first rent house, I wouldn’t mow until the grass was tall enough for raccoons to hide effectively. As a result, I would end up with large piles of dead grass on my lawn from my bagless mower. My elderly neighbor would leave her rake leaning against my house. I stubbornly refused to take the hint. After I got married and moved to the suburbs, I got a little better about mowing. Only muskrats could hide, and I owned my own rake. We bought a riding lawnmower because to us, the backyard looked huge. It wasn’t, and a good portion of it didn’t have grass at all, but it still looked huge. But even having a machine vaguely similar to a four-wheeler—with a cup holder, no less—did not increase my interest in mowing. Then last year, the riding mower up and died. There’s something wrong with the carburetor, but every attempt I’ve made to fix it has failed. I’m not a small-engine guy, just like I’m not a lawn guy. I finally paid somebody to mow the lawn one last time before winter, then ignored the problem till this summer. This year, we got a push mower via freecycle. It lasted a while, then died. My father loaned me another push mower and a two-wheel weedeater, and a trailer to pull them home. The weedeater died immediately, the mower lasted a short time, and the trailer was stolen. It was about this time that I decided our house was built on top of an ancient lawnmower burial ground, and was therefore cursed. I thought perhaps buying new would appease the spirits. I did some shopping, and was heavily leaning toward an electric mower. I’d had an electric weedeater I liked (which also died this year, but not while it was at my house, so I think it was unrelated to the curse), and anything without a carburetor seemed like a good idea. The cordless lawnmowers were out of our price range, so I began working out if I could get by with a corded one. As I was planning the most efficient route that would shred the fewest extension cords per mow, I realized I was replacing one type of complexity with another. 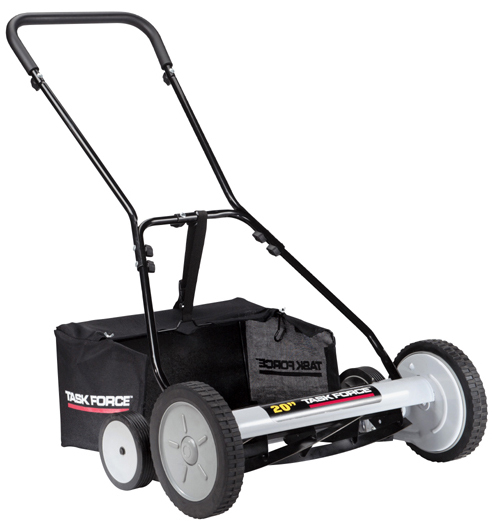 An electric mower wouldn’t solve my issue with mowers—that they really require more maintenance than I’m willing to give them—it would only replace that issue with a different one. I started wondering if there wasn’t a simpler solution. That’s when I started researching reel push mowers. When the idea first came to me, it seemed like such a perfect, beautiful, simple idea. One of those ideas that either works out great, or kicks off a series of misadventures that at some point lead to the idea-person being covered in mud. But it was a fairly cheap thing to try, and mud doesn’t bother me that much, so I decided to go for it. I took it home and assembled it. It looks like a Segway’s hick cousin. When I took it out for it’s first mow. I pushed it two feet and the thing stopped. Wouldn’t budge. I got out my tools, adjusted the cutting plate, and was back on my way. The whirring blades created a cloud of grass clippings around themselves, so I named it Edward Scissorhands. That first mow was quite a test—the lawn was a bit overgrown, and some of the weeds were too tall for Edward. Still, I thought it went pretty well, and with the help of the weedeater the lawn looked good. I went out again the following week, and things went much smoother. I’ve mowed a couple more times since then, and each time seems a little easier than the last. It’s not the easiest thing to push, but it’s not terribly difficult either, and I can definitely use the workout. So have I found the perfect lawnmower? For me, I may have. It starts right up, it’s environmentally friendly, it’s good exercise, and it’s low maintenance. It can’t handle weeds above a certain height, so I’m forced to mow more often. And the lawn looks better to me. I don’t know that it actually is better, but to my eyes it seems better groomed. I’m still not a lawn guy, but after each mow I am a little proud of what I’ve accomplished. And so on this, Blog Action Day, I would ask you: Do you need as much lawnmower as you have? Or could you, perhaps, simplify?